On the spot comfort. 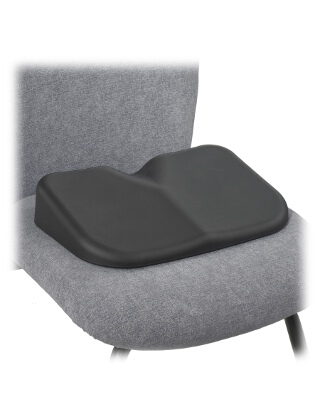 The perfect companion to the SoftSpot back rests. The exclusive Therasoft cushioning material combined with softly curved edges distribute weight and help to minimize pressure points. Cushions and supports the lower back and spine helping to reduce strain and fatigue. Cut-away contours slope away from pressure points at the coccyx (tailbone). Wedge shape helps promote proper seating posture to maintain the spines natural ?S" shaped curve. Non-abrasive, anti-static and washable. Available in Black only. Packed 5 per carton.